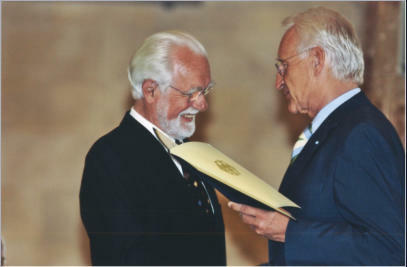 The Bavarian Prime Minister, Dr. Edmund Stoiber, hands over Prof. Dr. Pratzel the Order On Ribbon of the Federational Republic of Germany "Bundesverdienstkreuz am Bande". It is the highest decoration awarded for honourary service of the Federational Republic of Germany (like OBE). M. D. habil. D. Sc. Diplom-Chemist Akademic Director a. D.